The content of this article is currently under review by the Ethics Committee, and may be revised in the near future to comply with SCP Foundation ethical standards. You are reminded to check your inbox regularly for procedural updates and to contact your project supervisor or Ethics Committee liaison if you have any questions regarding ethical standards compliance. Personnel with sufficient clearance may view relevant proceedings at the bottom of this document. 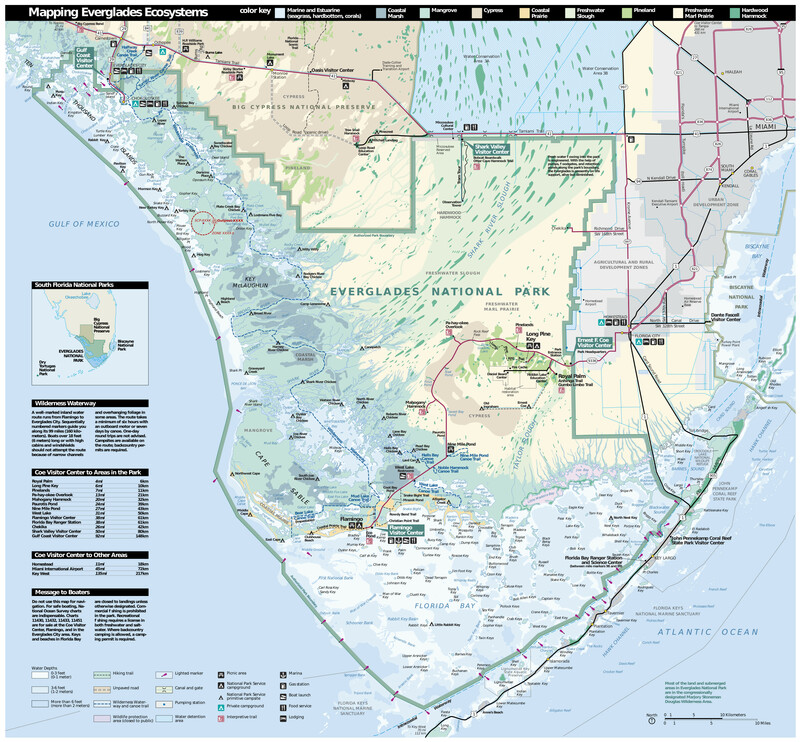 Map of Everglades National Park, showing the location of Zone XXXX-δ and other relevant landmarks. Click the image for a full map. Special Containment Procedures: Zone XXXX-δ has been kept off-limits to the public since its establishment, currently under the cover story of a protected habitat for the critically-endangered Florida panther.1 Staff at Outpost-XXXX are to record all time spent within Zone XXXX-δ; when exposure time reaches three-fourths of the critical cumulative XXXX threshold,2 staff are to be immediately removed from Zone XXXX-δ and reassigned elsewhere. Research staff may also be assigned to non-field research on SCP-XXXX at another Site. SCP-XXXX is contained by restricting total exposure time to Zone XXXX-δ. All persons who exceed the critical cumulative or acute XXXX thresholds3 are to be considered instances of SCP-XXXX-1 and should be contained within standard low-threat anomalous humanoid containment cells at a Site outside of Zone XXXX-δ. Trespassers within Zone XXXX-δ should be assumed to have been exposed to SCP-XXXX beyond the critical XXXX threshold unless it can be proven otherwise. A high percentage of incident reports have been noted to stem from Foundation staff attempting to deliberately infect themselves with SCP-XXXX. This deliberate infections have continued to occur, and in fact have increased in frequency, despite measures to curtail accidental infection by tracking employee exposure time. Staff accomplish this either by deliberately falsifying exposure-time records or by entering Zone XXXX-δ illegally while off-duty. These methods rely on multiple sub-critical short-term SCP-XXXX exposures accumulating over the long term to a critical level. More accurate tracking of staff exposure times could prevent this deliberate infection. To reduce the incidence of SCP-XXXX infection among SCP Foundation staff, new procedures will be implemented to better track exposure times over the long term so that employees can be removed from active SCP-XXXX containment before critical exposure. A system whereby all employees working within Zone XXXX-δ are tracked via mobile-device geolocation, a subcutaneous implant, or other feasible means. That staff found to have been exposed to SCP-XXXX for more than 75% of the critical exposure threshold are to be immediately removed from Zone XXXX-δ, amnesticized, and reassigned to a project outside of the American Southeast region. SCP-XXXX has, in over 150 years of Foundation monitoring, shown no ability to spread beyond those 'infected' due to extended proximity to SCP-XXXX. Additionally, SCP-XXXX has, in the same length of time, demonstrated no deleterious effect on infected staff, Foundation activities and goals, or the public. Proposal ●189de80-231E-c05-P1 places an unnecessary burden on SCP Foundation staff and resources for a dubious practical benefit. Proposal ●189de80-231E-c05-P1 is hereby contested by the ●Ethics Subcommittee on Staff Health and Safety, and is blocked from official implementation pending discussion, arbitration, and an official vote by the General Assembly. The reclassification of SCP-XXXX-1 instances which had previously worked for the Foundation as Thaumiel-class anomalies, and the restoration of said instances to positions within the Foundation. A system whereby the number of Thaumiel-class SCP-XXXX-1 instances is tracked by department, Site, Area, or geographic location. That the percentage of SCP-XXXX-1 instances among Foundation employees in any given department, Site, Area, or geographic location be maintained below a threshold of 5% of total staff compliment. That XXXX-1 instances in excess of this threshold be immediately reassigned such that the threshold is maintained. A system whereby Foundation staff working with SCP-XXXX may apply to become infected with SCP-XXXX. That the number of personnel allowed to undergo this process be severely limited such that no more than 0.1% of total Foundation staff may be SCP-XXXX-1 instances. That applicant personnel undergo standard psychological and memetic screenings. That personnel be selected by random lottery from applicants who pass the above screenings. Collapsed 154 discussion records by 12 subcommittees (●27d, ●c05, ●be2, ●258, ●38b, ●434, ●93e, ●63a, ●0a0, ●f2b, ●db0, ●f0d). 2. Currently set at 120 hours of cumulative exposure to SCP-XXXX. 3. 120 hours of cumulative exposure or 24 hours of continuous (acute) exposure to SCP-XXXX. 4. See Test Log Aggregation Document XXXX-21 for an overview of visual tests.